In a great in-depth interview with The Hollywood Reporter, superproducer Greg Berlanti discussed many things. He chronicled his rise in show business and showrunning from his days at 'Dawson's Creek' to masterminding the DC Comics' television universe. One of the great revelations in the must-read interview is that there is a 'Booster Gold' movie in the works and he might direct it. I'm attached to a few films [at Warner Bros.] now, and one, Booster Gold, is a DC property. Zack Stentz, who wrote an episode of Flash last year, just got the job, so he's writing the script now. I'd probably direct that, or I would want to. Stentz wrote the episode that aired on May 10 entitled "The Runaway Dinosaur" and was directed by Kevin Smith (Clerks, Tusk). It was one of the best episodes of the season encapsulating all the fun, action, and emotional drama the show is known for. Stentz also wrote Thor, X-Men: First Class, and episodes of Fringe. Berlanti had previously been working on producing a 'Booster Gold' pilot for television but as it turns out Warner Bros had bigger plans for the fan-favorite character. Berlanti kept busy with launching 'Arrow' for the CW, then 'The Flash' and 'Legends of Tomorrow' as well as CBS's 'Supergirl' (which has moved to the CW for its second season). 'Riverdale' is another live-action comic book drama coming this fall from Berlanti Productions based on the characters from Archie Comics. Created by Dan Jurgens in 1986, Booster Gold (aka Michael Jon Carter) was one of the more fun heroes to emerge from the 80's especially when paired with the Blue Beetle. Ted Kord playing the straight man to Gold's self-absorbed glory hound. Gold was from the 25th century who traveled back in time, to our present day, with stolen advanced technology that helped him play hero for fame and fortune. Over the course of the character's arc in comics he learns to become less selfish and grow into a true hero. The majority of the time Gold provided plenty of comedic relief as a member of the Justice League. 'Gold' would make a surprising but refreshing addition to the DC Extended Universe providing a much more lighthearted approach than usual. Something critics continually torch DC movies over for not having enough humor and joy in them. Not that it's a requisite, but having a time-traveling loveable jerk who learns to be a better hero is full of funny possibilities. Having Berlanti direct would give him a chance to do the character justice in ways he wasn't able to do with 'Green Lantern' back in 2011. The infamous Ryan Reynolds superhero vehicle with the CGI suit and disastrous box office still bears his name as writer and producer to his chagrin. "I got fired from that movie as a writer and as a director, and yet my name was all over it. I still get blamed for it, even though I had nothing to do with the finished product," he told THR. "Having to go every day to see whatever version of the film that they'd concocted at that point was a bit like having to buckle in and go drive to the same auto accident every day and get hit by the same car." Directing is something he'd like to do more of and has different projects in the works, one is with Showtime. When asked if he'd be interested in directing the big screen version of 'The Flash' starring Ezra Miller now that its director has left Berlanti explains,"No one's discussed that with me, but I could never direct a Flash movie that Grant Gustin wasn't the lead of. He's my Flash." No other details have emerged about the 'Booster Gold' film except Warner Bros had previously added two more movie release dates to their schedule, one on Oct. 5, 2018 and the other on Nov. 1, 2019. The current speculation is that Ben Affleck's solo Batman film will take one of those dates possibly leaving the other for Berlanti's 'Gold.' With Stentz writing the script casting can't be too far behind perhaps in time for an official announcement at this year's Comic Con in San Diego. There'll be more to follow. 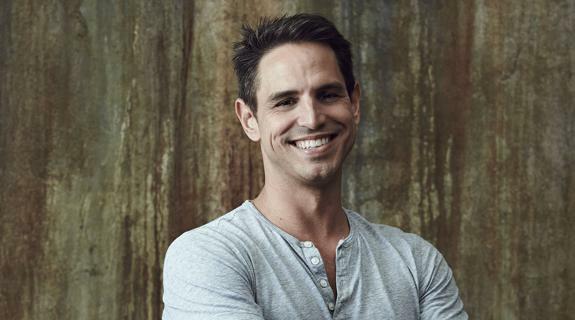 Check out this short clip from THR's interview with Greg Berlanti.